Olympians' athleticism and thirst for greatness -- compared to your thirst for a sugary beverage and ability to spend an entire weekend on the couch -- is what makes them so watchable on TV. While you may envy their athletic talent and toned bodies in four-year increments, Olympians adopt a rigid lifestyle every damn day that takes focus, dedication, and passion. Twenty-plus hours of training each week, combined with a monitored nutrition plan is how Olympians are made. Most people are lucky to clock in a 10th of that in exercise each week, to say nothing of the delicious, disgusting food you love eating. But perhaps you're seeking slightly more definition to your arms, and less of a limp hang to your gut. You may not win any medals, but that doesn't mean you can't steal a few tips from the pros. Er, amateurs, don't want to offend the IOC. We spoke with Miguel Ortiz-Cañavate, a 6'2", 193lb Olympic swimmer competing for Spain, to learn what it’s like to train and eat like an Olympian. In swimming, as with most Olympic sports, there's no real offseason. So they’re rockin’ a beach body year round. Must be nice. "Monday, Tuesday, and Fridays are two-a-days, which include one weight session in the morning, followed by a power workout in the water. 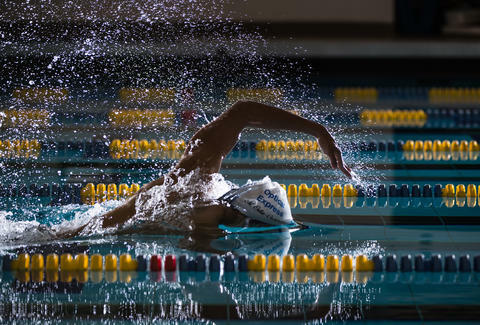 Power workouts usually consist of short bursts of speed with equipment, such as fins and paddles," explains Ortiz-Cañavate, former NCAA champion for the University of Michigan. "Wednesday and Saturday mornings are race pace days. 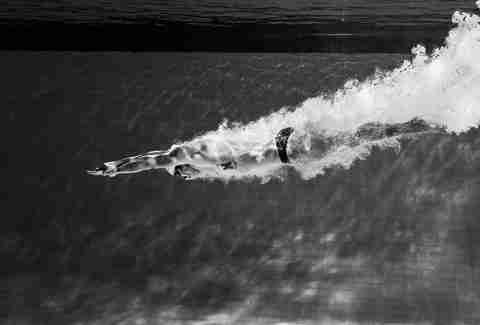 We simulate the effort of the race and try to improve on details in order to swim more efficiently during a race." So five days a week of morning practice. Then there’s the afternoon. Throughout the week, training sessions focus on different techniques for the athlete to improve upon. In swimming, practices might include aerobic exercises, speed development and endurance training, weight training, kick sets in the water, and recovery. "On Mondays, we do aerobic work, in which our heart rate doesn’t go above 150 beats per minute. On Tuesday, we do speed development and endurance training, in which we work to find the optimum speed and stroke rate for each race, and build endurance." With a training schedule that complex, diet and nutrition are extremely important. Imagine doing a three hour practice after eating a pizza donut. Might not be a pretty sight, especially if you don't wait 30 minutes before you get in the pool. Protein, carbohydrates, and healthy fats are the three macronutrients to track, all of which contribute to high-level performance in different ways. If you're trying to go build muscle, for example, you'll probably go heavy on the protein, whereas distance and endurance athletes may focus more on the carbs. "After calculating it with my nutritionist, I consume about 5,000 calories a day when I’m in season. During taper (or resting period), I usually consume about 3,500 calories a day. But that’s definitely not as significant as Michael Phelps, who eats 10,000 calories a day." Compare that to our daily recommended 2,000 calorie diet (which is either shamefully overachieved or extremely underachieved). And Olympians are constantly eating. As philosopher-swimmer Ryan Lochte recently said, "If I’m not eating, then something is wrong." "I just eat whenever I feel the need," adds Ortiz-Cañavate. "I usually eat a snack before morning practice, then breakfast at 11:00 am, lunch at 1:30 pm. And depending on the practice schedule, I’ll eat dinner, than a snack, or vice versa." "Breakfast is usually an avocado shake made with honey, chia seeds, and milk, two eggs (usually sunny side up), and bacon and sausage. Lunch might be any carb-filled meal, like pasta, fried rice, or ramen. For dinner, I’ll have any type of protein, such as chicken, lamb, steak with vegetables. Oh, and I need dessert. Preferably ice cream, I consider it my snack." Ice cream as a snack? I’ll take it. Speaking of ice cream, cheat days are a frequent occurrence. Olympians are still human, after all, and funnel cake ice cream sandwiches need to be taken advantage of. "Sometimes you need to eat what you want -- in my case it’s McDonald’s. I believe it’s good for your mental health." Listen, we all have our idiosyncratic beliefs that keep us sane. With a summer of intense training and strict dieting in preparation for the games, some Olympians keep in mind their post-competition binge meal. "I’ll be staying in the Olympic village even after I compete. It serves all kinds of food from around the world. They even have McDonald’s, so I will definitely hit that up." Marina Nazario is a freelance writer from NYC and eats McDonald's every Friday as a reward for getting through the week. Follow her on Twitter: @marinajane19.